You can forget the wheel, nuclear power, and even the internet. 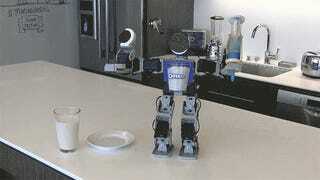 All of man's greatest creations have been eclipsed by this pint-sized robot that's able to make custom Oreo cookies whenever you have the craving. It can't do laundry, it can't do cleaning, it won't walk your dog. Its sole purpose in life is to extrude delicious Oreo creme onto forgettable Oreo cookies, depending on what color seems most popular online at the moment. Is it cheaper than just buying a bag yourself? Probably not. But it's certainly easier that walking all the way to the kitchen to fetch a cookie when hunger strikes. Restaurants know that delivery options are key, and cookie manufacturers are finally catching up.